Russ saw me making these bars the other day, grinned and said, “I LOVE baking season!”. Lol. He certainly does. Him, the boys, and I admit to a fondness for it myself. It’s funny; the rest of the year, I’m not as big on making cookies. I’m more of a quick bread, yeast bread sort of baker The whole plopping cookie dough down, or cutting, shaping, etc, drives me nuts. I shamefully confess that my attention span is that of a four year old in many ways and standing or sitting still to get something repetitive done isn’t a favored pastime. But at Christmas I’m all about the cookies. The standing long enough to shape or roll though is exactly why I love bar cookies 😀 I get the dough in a pan, top with whatever if that is part of it, bake, cut, eat. What could be easier, right? These are delicious. Not really the type you’d put on a cookie tray though, so don’t use them for that. These are the ones you put out with the rest of the desserts. They are large, hearty bars, meant to be eaten with a fork. Kind of still on topic, do you have your tree up yet? This is the first time in my life I’ve ever had a real tree. I grew up with fakes ones, used them my whole life, but Russ decided this year that he wanted a real one. I’m not sure how I feel about it. I think I had this vague expectation that the house would suddenly smell all Christmasy and piney. But *sobs* it doesn’t. It’s like having a fake tree in the house, but we have to keep it watered. It IS prettier than the fake tree we had, though. That one had seen better days and I’m pretty sure the mice had attacked it when it was stored in the garage. In a large bowl, on low speed, beat together the butter and shortening. Add in the sugar, baking powder, salt, vanilla extract and 1 teaspoon of the almond extract and beat well. Still using the mixer on low *unless you enjoy being covered with flying flour*, carefully beat in 2 cups of the flour. Get a heavy wooden spoon and use that to mix in that last cup of flour. Scoop out and set aside 1 1/2 cups of the dough. Press the rest into the bottom of a 15×10 inch baking pan. I find the easiest way to do this with sticky dough is to dump it all in the pan, then lightly flour my fingers to press the dough in, repeating the flouring as needed. Bake the dough at 350 for 12 minutes. it will be just starting to turn a pale brown at the edges. While it bakes, stir the remaining 1/2 teaspoon of almond extract into the pie filling. After taking the crust out, carefully spread with desired amount of pie filling. I used about 1 1/2 cans. One can isn’t enough; two is a bit too much. Sprinkle the chocolate chips over the top, then dollop spoonfuls of the remaining cookie dough evenly over the fruit filling. Continue baking at 350 for 35 to 45 minutes or until the top is a light golden brown. Let cool for an hour, then glaze. The glaze is easy peasy. Just whisk together the glaze ingredients, adding more milk if you want it thinner and drizzle desired amount over the pan of bars. When totally cool, slice into squares. The guys and I went to visit my second oldest son Cameron and his wife Tiffany last week. They live in Tennessee with a mountain view and it’s so darn pretty it will make your eyeballs bleed. No, I’m not sure why your eyeballs would bleed. Don’t pressure me for logic here. I have a headache. But…while we were there, Cam made a yummy dinner one night of a smoked brisket and some homemade refrigerator pickles (recipe coming soon, since I swiped it from him). For dessert that night, we had a Smores Pie my daughter in law made (also recipe coming soon. it was SO good!) 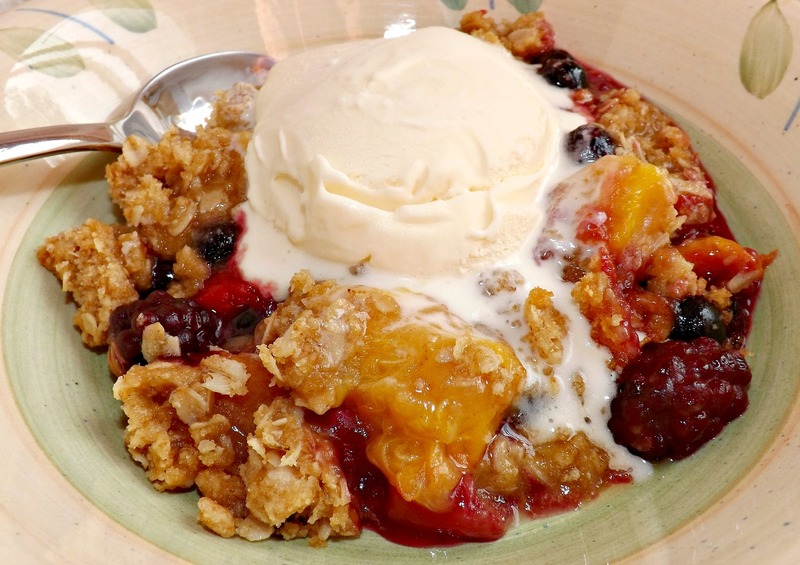 and I also whipped up a three berry and nectarine crisp. I made one similar to this last Summer, but this one was much better, I have to say. It wasn’t as sweet, I’ve perfected my streusel since then (If I do say so myself) and I omitted the lime cream I served with that one and we had it with ice cream. So, so delicious and seasonal. This also doesn’t use as many nectarines, but instead I upped the berries. If you don’t like nectarines, go ahead and use peaches. I prefer nectarines myself because they aren’t fuzzy, making it unnecessary to peel the fruit (thus saving time and also adding a bit of fiber to the crisp), plus they tend to be sweeter and juicier. But you do you. Preheat oven to 350 degrees. Lightly butter a 3 quart baking dish; preferably a glass one, as metal pans can react with the fruits and leave the filling with a grayish tinge, plus metal with fruit can have an off flavor. In a medium bowl, combine all the dry ingredients for the streusel. Use a pastry cutter to cut the butter into the dry ingredients. Get it barely cut in, then it’s easier if you use your fingers to finish. Just grab the streusel and kind of rub it between your fingers and thumb to help combine the ingredients. You want to end up with pieces ranging from pea sized to quarter sized. Note- do NOT use warm butter. The butter has to be cold for streusel to work. Otherwise, it all melts when baked rather than ending up as nice crunchy chunks. Sprinkle the streusel over the top of the crisp. If you don’t want to use it all (but why not? ), just freeze what you don’t use. Bake at 350 degrees until the top is golden brown and the fruit filling is thickened and bubbly, about 35 to 45 minutes. Serve warm, preferably with a big old scoop of vanilla ice cream on top! I am an avid reader of magazines that involve cooking. Be it straight out cooking mags like Bon Appetit, Saveur, Food Network and Food & Wine, or others like Family Circle and Womans Day, I am subscribed to them all. I search until I find them for wonderful prices like $5.99 a year (honest Injun… you can get some great deals on magazines if you look around; and not just the “womens” mags either!!) and then and only then will I get them. Then, when I’m done with them, which includes tearing out recipes I want to try, they go to the residents at the long term care facility my husband works at. The residents there never lack for magazines to look at, I’ll tell you that much! Sadly though, even when I tear out recipes from the ones like Woman Day or Family Circle, I never have a whole lot of success with the recipes themselves. I’m not sure if it is a lack of proper testing at the test kitchens or what, but there ALWAYS seems to be an issue or two that needs fixed. I got this recipe from Womans Day and it was, unfortunately, no exception. I lost the paper version, so had to look it up online and found it on their site, but the recipe itself was so fraught with errors in direction and ingredients that I had to pick through it and work with it. I’m an experienced cook, so it turned out delicious, but I shudder to think what would have happened with a novice cook. The pan size was wrong, the sugar measurements were off, etc etc. BUT!!! Like I said, I didn’t just fall off the turnip truck yesterday when it comes to cooking (yet another saying about which I ask, “wth does that even mean! ?”), so I fixed the “boo-boos”. Once done, this is a delicious cheesecake bar. It uses up some of the last of the season fresh blackberries quite nicely. 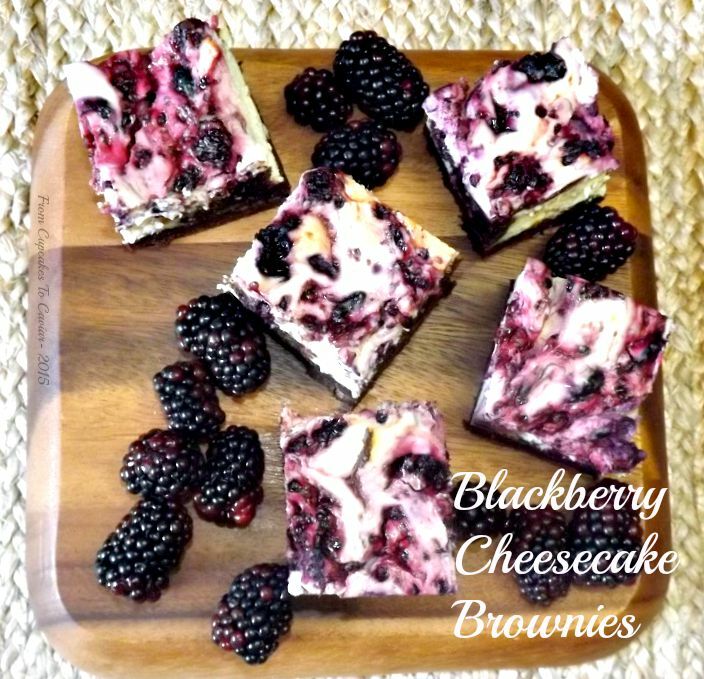 You have a VERY rich brownie base layered with a creamy cheesecake filling and finally that part is swirled with fresh blackberries. So your mouth gets a nice mix of “ooo, chocolate. No, creamy. No, berries!” to keep you guessing. So, you know the drill. Get to cooking! Heat your oven to 350 degrees. Line a 9 inch square pan with foil, leaving enough to overhand the edges of the pan. You’ll use that as a handle later to lift the brownies out of the pan. Spray with cooking spray and set aside. In a small pot, over low heat, melt together the butter and 1 1/4 cups of the chocolate chips, stirring occasionally. Remove from heat when melted and set aside. Whisk together the 3/4 cup flour, the cocoa powder and the salt. In a large bowl, on low speed with a hand held mixer, combine the sugars and the 3 eggs. beat JUST until combined. Stir in the flour mixture and the last 1/2 cup of semi sweet chips. Gently fold the chocolate/butter mixture into this. Set aside to make the cheesecake batter. Wash your beaters and in a large bowl, on low speed, combine the cream cheese, sour cream, 1/2 cup sugar and 2 tablespoons flour. beat just until smooth and creamy. Add in the 2 eggs and the vanilla extract; beat just until combined. Scoop about half the brownie batter (about 1 1/2 cups) of the brownie batter into the prepared pan and smooth. Top that with half of the cheesecake batter, then the last half of the brownie batter. Carefully pour the other half of the cheesecake batter on top and gently smooth it out. Bake at 350 degrees just until the top is set, about an hour. The edges will be set, but the center should still have the tiniest bit of a jiggle to it. It will finish setting up as it cools. Let cool in the pan for an hour, then refrigerate for at least two hours to overnight to finish firming up. Use the foil “handles” to lift the brownies out onto a cutting board and then use a large serrated knife to cut into bars, dipped in hot water and wiped dry in between each cut. There are some foods that it is dangerous to leave me alone with. Set me in front of a dish of panna cotta and you’re likely to come back in 30 minutes and see that I’ve eaten mine, yours, everyone’s and am now sitting in a panna cotta stupor on the floor, grinning like a loon. Put creme brulee near me and I can’t be held responsible for my actions. Give me a bone in ribeye and some roasted brussel sprouts and soon enough, I’ll be that person moaning saying “I can’t believe I ate the whole thing”. There are also some foods that aren’t quite as “normal” that I’m not safe around. I eat fries when I have a ribeye. I also set the baking sheet full of overly greasy fries back in the oven and eat them for breakfast the next day. Yes, feel free to gag. Then there’s Cheetos. I shamefully admit that I have been known (in the past, in my weight loss defense) to polish off the majority of a large bag of Cheetos in one sitting while watching reruns of The Big Bang Theory. This cheesecake however, does not go into the not so normal category. It may go into the “omg, this is good!” category though. I have been making this cheesecake for years; more years than I care to admit. It originally came from yet another of those decades old paper Pillsbury cookbooks I have collected for…well, decades. Yes, I’m old. Fifty as of this past Tuesday, actually. *sobs just a little for lost youth, then gets over it and eats more cheesecake* Liiiiiike I said, I’ve been making this for years. I changed it some from the original but not enough to say it’s a totally different cheesecake, just added a few ingredients, took away almonds in the crust and bake it in a water bath to minimize cracking. It also originally had a sour cream topping and I do use that sometimes, but I prefer the topping I have here. 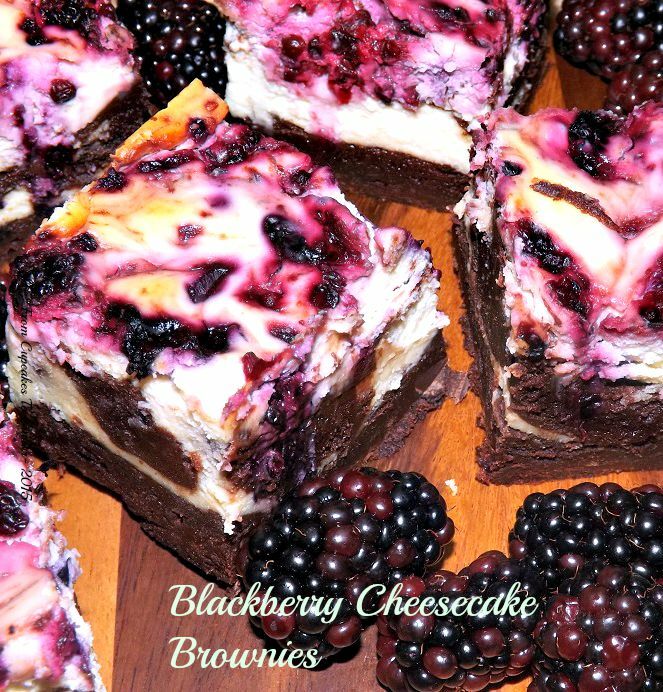 This is a wonderful base cheesecake to play with. You have a chocolatey, buttery crust, topped with a very creamy chocolate filling. I always add a touch of almond extract to the filling. It doesn’t make it taste almondy; don’t worry. It just adds that little something that makes people say, “what is in this?”. The filling is smooth, rich and creamy. Then I topped it this time with the worlds easiest strawberry sauce and dolloped it with a slightly tart cream and sour cream topping. In the past, I have also drizzled this with caramel sauce, cherry topping, peaches, etc. Like I said, this is a great base to play with. It’s also dam good on its own so try it like that first. This goes together quickly and if you bake it as directed, there will be little to no cracking on top. Preheat oven to 325 degrees. Cover a 9 inch springform pan with 2 layers of heavy duty foil, making sure it goes up about 3 inches on the sides. This helps prevent water from getting into the pan as the cheesecake bakes. Lightly butter the whole pan. In a large bowl (or your food processor), mix together the crust ingredients. Press them onto the bottom and about 2 inches up the sides of the prepared pan. I have found that using the bottom of a small glass is the easiest way to press any crumb crust in. It is much more even and firmly pressed in that way. Set the crust aside. In a large bowl, combine the cream cheese and sugar. Beat on medium speed until light and fluffy. Add in the eggs, one at a time, beating well after each addition. Add the melted chocolate and extracts; beat well. Add in the cream and melted butter. You’re best off whisking these in because trying to beat the liquid into the batter results in a lot of splashing, even on low speed. Pour the batter into the prepared crust. Gently tap the pan on the counter to level it and help get rid of any air bubbles in it. Place pan inside of a deep baking pan. Slide into the oven and carefully pour boiling water around the cheesecake to a level of about one inch up the sides of the pan, being careful not to splash any water into the cheesecake. Bake at 325 degrees for 60 to 75 minutes (large time gap, but I have had it go to both extremes. ), until the cheesecake is set around the outer third but the center is still rather soft. It will set from residual heat as it cools. Cool for five minutes on a rack then loosen the sides and carefully slide off the outside of the pan. Finish cooling completely until room temp, then refrigerate until 30 to 60 minutes before you’re ready to serve it. About 30 minutes before serving, make the sauce and the topping. The sauce couldn’t be simpler. In a medium bowl, combine the strawberries and the sugar. Let sit for about 30 minutes so the sugar has time to dissolve. For the topping, in a large bowl, combine the topping ingredients. Beat at medium speed (careful of splattering) until the mixture is thick and creamy with firm peaks, about 4 minutes. Top each slice of cheesecake with some strawberries and topping. Eat. Curse me as you loosen your pants. Know that I’m over here giggling at you. When we get to this part of Winter, that time when you have some warm days then Winter has a hissy fit, backpedals and becomes cold again, I start having major cravings for fresh fruits. Citrus is always a good bet since it’s still in season, but I want berries, darn it! Problem is, what I can find in stores around here, besides being outrageously expensive, has been shipped either from the other side of the U.S. or from another country altogether. So it’s no longer very fresh and it just doesn’t have the flavor that in season berries have. So I compromise. I buy frozen berries. Believe it or not, they are a damned good substitute. With any company worth buying from, the berries are frozen within hours of being picked so you are still getting something that is extremely close to fresh. You may not be able to use it in ALL the same ways you can fresh ones, but in baking, so long as you remember the rule of thumb to use it still frozen, not thawed, you can use it in a LOT of recipes. You may know I love bread pudding. I used to hate it, but have come to love it since I began making it myself and realized it didn’t always have to be an insipid nursery food with no flavor. Like I mentioned to my husband the other day, I like foods with strong flavors and that includes in bread pudding. This one definitely satisfies. I have made bread pudding enough now that I have no need of a recipe; I just change up the basics to go with whatever add ins I’m doing. This one turned out wonderfully. You have a mild lemon tang and peel taste in the pudding with a bit of smooth white chocolate in there. Then practically every bite, you get some nice tangy berries. It’s bright and fresh tasting and perfect for this time of year. I loved this both warm and chilled. Warm, it’s softer and the flavors are more intense. Chilled it has the texture of a firm mousse, which I love. So far I’ve had it only with some cream poured over it, but I can see this going quite nicely with a berry sauce or custard sauce. Preheat oven to 325 degrees. Butter a 4 quart baking dish or 2 2 quart ones. I used 2 2 quart souffle dishes. Place the baking dish/dishes into a large pan. An 11×15 works well. Place the bread cubes in a large bowl and set aside. Put your chocolate and lemon zest into a medium bowl. Heat the cream up in the microwave until very hot, but not boiling. Pour cream over the white chocolate in the bowl, stir once, then let sit for five minutes. Stir well to combine the cream and chocolate and complete the melting process. In a large bowl (I know; lots of bowls. Have your kids, neighbors, stranger off the street or husband or wife do the dishes 😛 ), beat together the 6 eggs and the vanilla until frothy. Add in the 1/2 cup sugar and beat well. Slowly pour the warm cream into the egg mixture. Make sure you spoon out any lemon zest that may have sunk to the bottom and get it in there too. Beat in the lemon juice. Let this mixture sit for about an hour so the bread can soak up the custard. 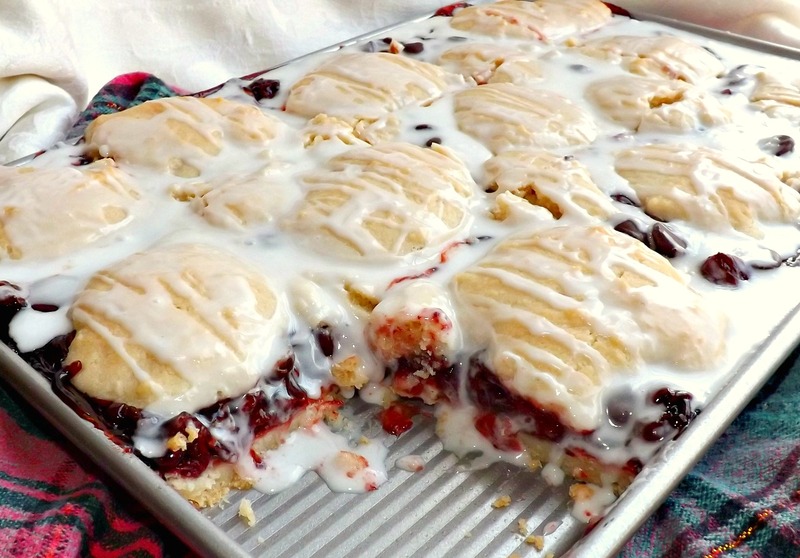 When ready to bake, carefully fold in the frozen berries. Pour the pudding mix into the buttered dish and place it in the middle of the oven. Pour boiling water in the outer dish to reach about a third of the way up the sides of the dish the pudding is in. Carefully push the oven shelf back in to avoid sloshing. Bake at 325 degrees for about 75 minutes or until the top is nicely browned and a knife inserted into the center of the pudding doesn’t come out liquidy and no liquid wells up in the hole left behind. Cool the pudding at room temp for about an hour. Then you can either serve it warm or chill it for later. I remember how back when I was a kid, when dinosaurs roamed the Earth and we wore Saber Tooth Tiger skins for clothing, some years at Christmas time, my mom would get a fruit tray to set out. She also got a bag of shell on mixed nuts every year that we loved but that’s neither here nor there other than a memory I have. As for the fruit tray, you know the kind I mean; all neatly set up, with dried peaches, pears, apricots, prunes and dates on it. In our household, the peaches and apricots would get eaten first and the prunes would sit there until we kids got desperate. I actually like prunes sometimes now but I still prefer the apricots. When I got older, I got into the whole cover perfectly good and nutritious fruit with chocolate thing. Easy enough; take a nice piece of fruit, fresh or dried and dip it into chocolate and cover up any nutritional value it ever had. What’s wrong with that, right? 😀 My favorite was of course to take a dried apricot and cover it in either semi sweet or white chocolate. 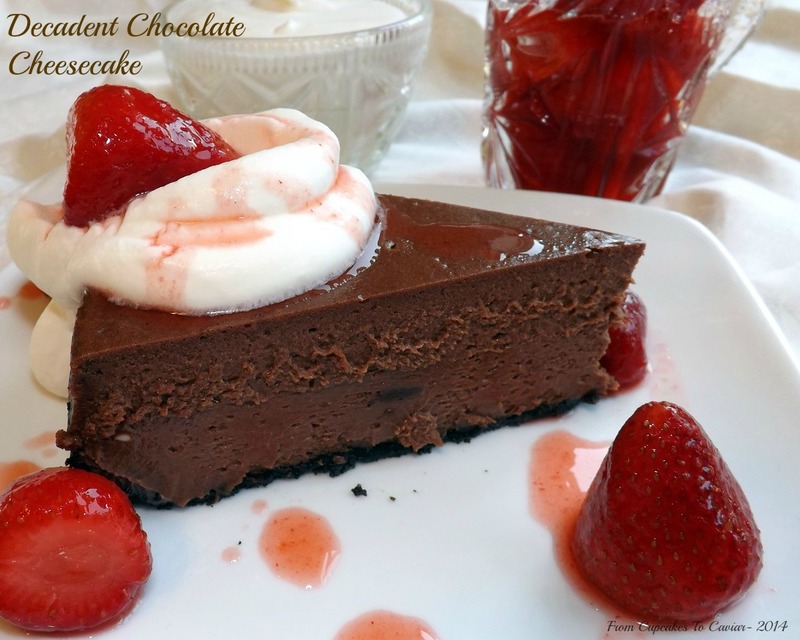 The chewy tangy fruit mixed with the sweet chocolate… pure Heaven. So when my friend Jenni over at Pastry Chef Online came up with an utterly delicious Apricot Swirl Brownie, it got me craving that fruit/chocolate combo again. So what did I do? 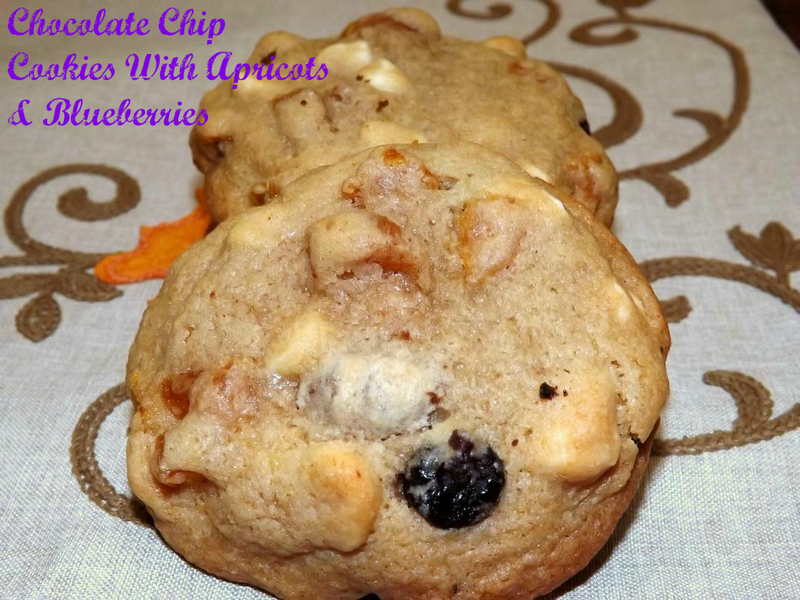 It isn’t entirely original because I have seen cookies with dried apricots and white chocolate in them before but I combined two of my favorite fruit flavors (in the Summer, I am constantly eating sliced fresh apricots and fresh blueberries with a little sugar and cream) in a cookie with both white and dark chocolate. I love the way this turned out; fairly reminiscent of those chocolate covered fruits I love. The soft sweet cookie, tangy fruits and bites of chocolate just go together so well! 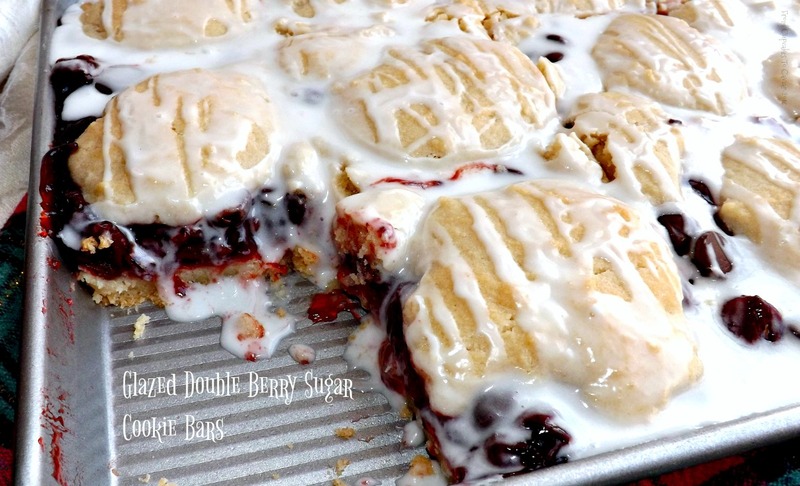 These are extremely easy to make so…. Preheat oven to 375 degrees. Put the dried fruit into a small bowl and cover with the boiling water. Let sit for 30 minutes. Drain well. Lay the berries in a paper towel and gently blot dry. Blot dry the apricots and chop into small bite sized pieces. Set aside. In a large bowl, combine the butter, sugars, and extracts. Beat well, until smooth and creamy. Add the eggs, one at a time, beating well after each addition. In another bowl, combine the flour, baking soda and salt. Stir to mix, then add to the butter mixture all at once. Beat at low speed until fully combined. Alternately, you can use a heavy wooden spoon to mix. Add in the white and dark chips; stir well. Add the apricots; stir well. Last, gently add the blueberries, being careful to not break them up more than can be avoided. Roll golf ball sized pieces of dough in your palms to get them rounded, then lay about 3 inches apart on large ungreased baking sheets. Bake at 375 degrees for about 14 minutes or until the top is light golden brown and the cookies look just set in the middle. They will firm up as they cool. If you prefer a crisper cookie, let cook for maybe an extra 2 minutes, until the top is golden brown and looks dry. Let sit on the pans for two minutes, then transfer to a rack to finish cooling. I got 27 good sized cookies from this. You could make them smaller but make sure to adjust your cooking time. Whoaaaaa mannnnnn, that’s a long title. But I wanted to fit all the goodness in there so I broke my own rule about trying to avoid long titles. This is also known as a flourless chocolate cake but that has such “omg, I can’t do that” connotations that I fiddled with the name some. Hey, I change recipes themselves, why not names too? :-p This is one of those desserts that, when people taste it, they are convinced that you 1) are a gourmet cook and 2) spent days making it. In reality however, this isn’t difficult at all. The most labor intensive part is making the berry sauce and you could used jarred ice cream topping if you wanted to or just serve the berries whole. I would of course, cry if you did, so just don’t tell me if you forgo the berry step. I don’t like crying. It makes my nose stuffy and I look like Rudolph the Red Nosed Reindeer after a 3 day booze binge. Back in the day, I would never attempted something like this because for some reason, I have to agree with the general assessment, it just LOOKS and tastes like it must be complicated. So if I can get over being a chicken, so can any of you out there afraid to try it. This isn’t even as complex as unbaked chocolate mousse because there is no egg separating, no whipping a ton of cream to fold in, yada yada yada. You melt some good chocolate and butter, beat the crap out of some whole eggs, fold them together and bake. Voila! Cake. And the topping I made as well as the sauce are also easy. You’ve got this. Honest. This cake is dense, rich, and almost fudge like when chilled. The texture changes at room temp and I personally prefer the silkiness it has when cold. But try it both ways and see how YOU prefer it. It’s outstanding either way. Use good quality chocolate in this, not say, Wal Mart brand. The flavor here is pure chocolate and you get what you pay for in this. Preheat oven to 325 degrees. Wrap a 9 inch springform pan in two layers of heavy duty foil. Line the bottom of the pan with parchment paper and grease the sides of the pan well. Set the pan inside a large baking dish. In a small heavy bottomed pot, over low heat, melt together the butter and chocolate. Stir constantly until you have a smooth lump free mixture. Pour in the Amaretto and extracts and mix well. Set aside off the heat to cool for five to ten minutes. Start some water boiling for the water bath. Not, not for you. You can bathe later. For the cake. Meanwhile, in a large bowl (make sure this is scrupulously clean with no greasy feel at all) beat all 6 eggs at high speed. Beat for a full five to ten minutes until you have nicely aerated, foamy, doubled in volume eggs. Stir about one third of the eggs into the chocolate mixture. Be gentle, don’t stir like you’re trying to cause it pain. Now gently fold in half the remaining eggs. Make sure there are no streaks of white showing. Then fold in the remaining eggs. Pour the chocolate/egg mixture into the prepared pan. Place pan in the 325 degree oven. Pour boiling water around the pan, careful not to splash any into it, until the water is about halfway up the sides of the springform pan. 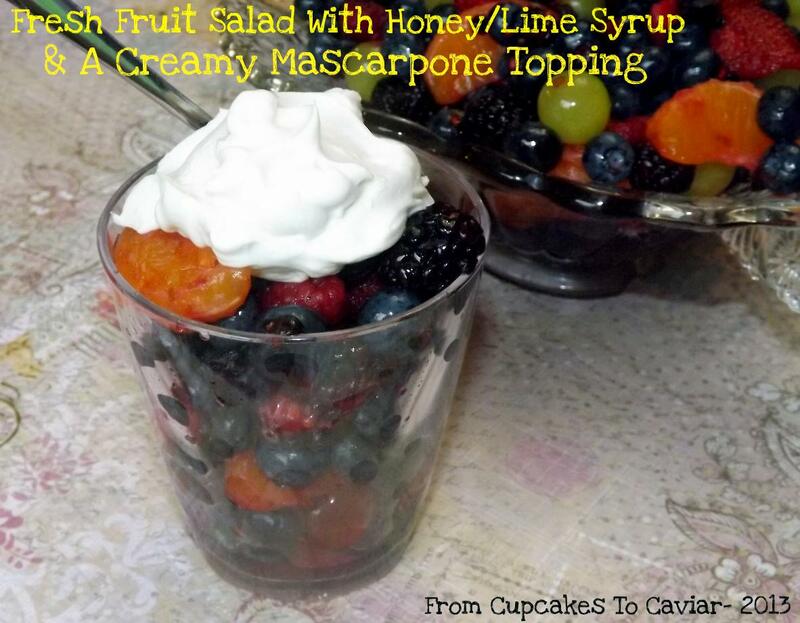 For the Mascarpone cream- In a small mixing bowl, beat together the mascarpone and the sour cream until smooth. Add in the powdered sugar and extracts. beat well. Chill. See how easy that was? For the berry sauce- make sure the berries are well drained, then pulse three or four times in a food processor with the sugar. Use the back of a large spoon to press the berries through a fine mesh strainer into a bowl, effectively getting rid of the seeds and pulp, leaving you with a nice smooth sauce. To serve- about half an hour before serving, carefully remove the side of the springform pan. Invert, then peel off the parchment. Invert back onto your serving plate. Use an offset spatula to spread the cream over the top of the cake. Alternately, you can just serve it on the side. 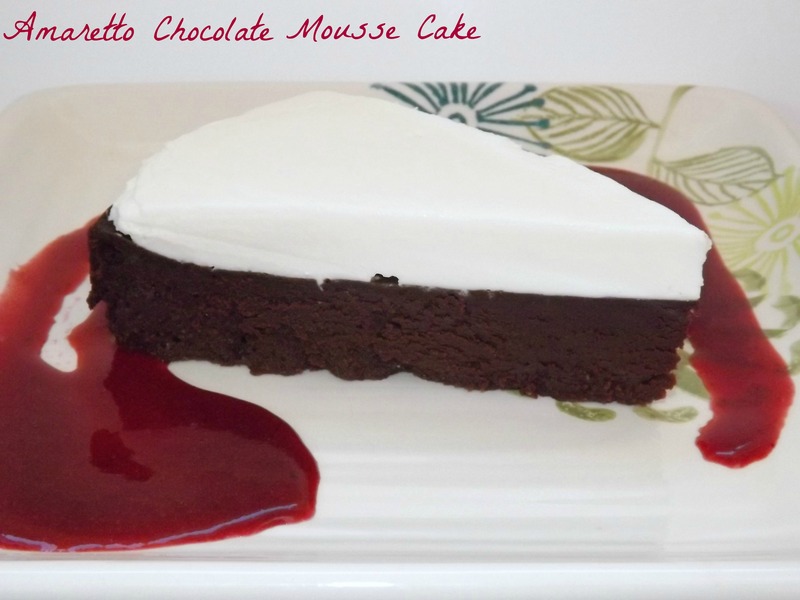 Cut thin slices of the cake with a very sharp knife and serve with the berry sauce. I’ve mentioned before that I’m not a big drinker. I like wine sometimes, Baileys in the Winter as well as hot chocolate with peppermint schnapps in it. And I admit to a liking for any of the vodkas made by Pinnacle Vodka. I have simple tastes there too though- toss some of the whipped cream flavor into Orange Crush and I’m happy hehe. Problem is, even with booze, though I don’t drink it, I get caught up in ideas surrounding it, especially nowadays with so many cool sounding things out on the market. I have a bunch of stuff gathering dust because it sounded interesting but if I drink hard liquor, I’m likely to be snoring within ten minutes. 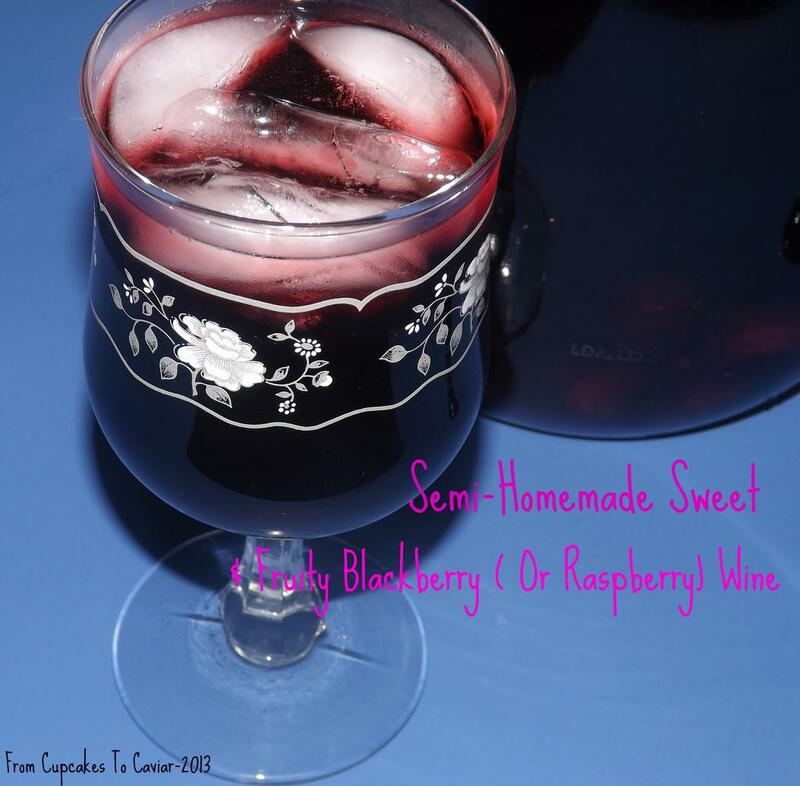 So, since I like to play with my booze :-P, a few years ago I decided to see what I could do to make inexpensive wine a bit better. I’m so far from a wine snob it’s kind of laughable. I have been known to happily drink Mogen David. I draw the line at Boones Farm though… had enough of that back when I was too young to know any better. Point being, I like sweet wines. Dry wines are too..well… dry for me. I love to use them in cooking and love the flavor they impart there but other than an occasional glass of Cabernet, I prefer my wines sweet. Not being able to afford a wine making kit complete with five gallon jug, locks, etc etc, I make my own with bottled wine. And EVERYONE who has ever tried it has loved it. it’s sweet, fruity, full flavored, NOT DRY, inexpensive for what you end up with and has a bit more of a kick than “normal” wines because of the brandy I add to fortify it. This is more of a technique than a recipe but I will post it in recipe format. make this this week and by the time Labor Day hits, you can strain it out and have a nice sweet glass of wine over ice while you grill out. You know the drill. Erhmmm, get to bottling?? Use a funnel and pour the sugar into the gallon wine bottle. Now take your frozen berries and shove them down into the bottle. This is boring and makes your hands purple but short of pureeing the berries which makes it difficult to strain later (trust me; I tried), it’s the only way to get them in there. but this is why you leave them frozen. Can you imagine shoving mushy thawed ones in there? Lol. Now pour the brandy in there. Cap the bottle back up tightly, shake it well and store it in a cool dark place. Go back once a day for the first week to shake it to keep the sugar mixed. Let this sit for about 3 to 4 weeks. Strain through a coffee filter set into a fine mesh strainer over a bowl (this takes a while so be patient) then taste it. if it’s not sweet enough for you, add about another half a cup of sugar then cap it and set it back in a cool place for another week. After that, pour some over ice and enjoy. This makes a great spritzer also. Just mix 1:1 with some club soda or 7-up. This can also be made with white wine and something like peaches, nectarines or pears. But I personally didn’t care for it as much. You may however. It’s funny the things that you associate with certain words. Forevermore, the words fruit salad will make me think of a toy guitar my four year old had when he was a toddler. He could press certain buttons on it and it would play snippets of songs, one of them being “Fruit Salad” by The Wiggles (I STILL have no darn idea who The Wiggles are!) Warning… watch this at your own risk. Brain cells WILL melt and leak out of your ears. That guitar disappeared one day (my theory is that I was sleep walking one night and gleefully broke it into a bazillion pieces and hid the body… I mean, pieces. and I thank God quite often for that unsolved kidnapping, murder, run away… whatever. But fruit salad like this will only disappear one place… into mah bellah. It is yummy to the max and if you don’t use the mascarpone cream (though why you wouldn’t is beyond me 😛 ) it’s even more or less good for you. I mean… it’s fruit… and limes (which are also a fruit 😛 ) and nice natural honey. Ok, ok, so there’s sugar in there too! Sue me! But seriously, this is a great alternative to a fattening dessert. And it can be made fairly quickly so it’s great for an impromptu bring to work or a bbq dish. If you make it ahead of time, the fruits pick up a lot of flavor from the syrup, but the oranges will also take on a purplish tinge from the berries so if you don’t want that, add the oranges about 30 minutes or so before serving. In a medium pot, combine the lime juice, lime zest, honey, 1 cup sugar and 1/4 cup water. Bring to a boil over medium high heat, then lower heat and simmer for one minute. Cool completely. In a large bowl, combine all the fruits. When syrup is cool, pour over the fruits and toss GENTLY. Cover and refrigerate for at least 30 minutes and up to one day. For mascarpone cream, combine the mascarpone, sour cream, vanilla and 1/2 cup sugar in a medium bowl. Beat at medium speed until smooth and creamy. Keep stored in fridge until ready to use. Using a slotted spoon, spoon the fruit into a serving bowl. Discard (or drink lol) the remaining syrup. Top each serving with a dollop of the mascarpone cream. I’ve always gotten a kick out of the regional competition between different parts of the country when it comes to food. Being born and raised in Chicago, I saw a lot of it there. Chicagoans will tell you that you can’t get sausage as good anywhere but there… and they would be correct. They will also tell you that the way they make hot dogs is the best… and they would, again, be correct. Then there’s pizza. While Chicago is known for deep dish, believe it or not, a native Chicagoan will tell you that Chicago is more known for thin crust pizza. And yes, it’s better there. I didn’t have deep dish pizza until well into adulthood. Go figure. One thing most people won’t argue about though is where one can get the best cheesecake. New York wins that. While, like I said, I’ve never been there (*sobs* I’m so travel deprived) I’ve tried enough cheesecake to be pretty certain which is the best. And a thick, dense, creamy New York style cheesecake is hard to beat. Though *she says with a sheepish grin* I DO have a liking for those creamy French style Sara Lee cheesecakes. Don’t judge! You need to give this one a try next time you get a hankering (yes, I just said hankering…what of it? 😛 ) for cheesecake. It is, as I mentioned above, thick (boy, is it thick), dense and creamy. Plus, with the quick berry sauce on top, it goes from wonderful to “omg, back away from this cheesecake cause it’s all mine!”. This is fairly quickly put together. It takes a while to cook and then to chill but it’s worth the wait. Mine took longer than the recipe said it would by about 50% time wise but that could be my oven, who knows. 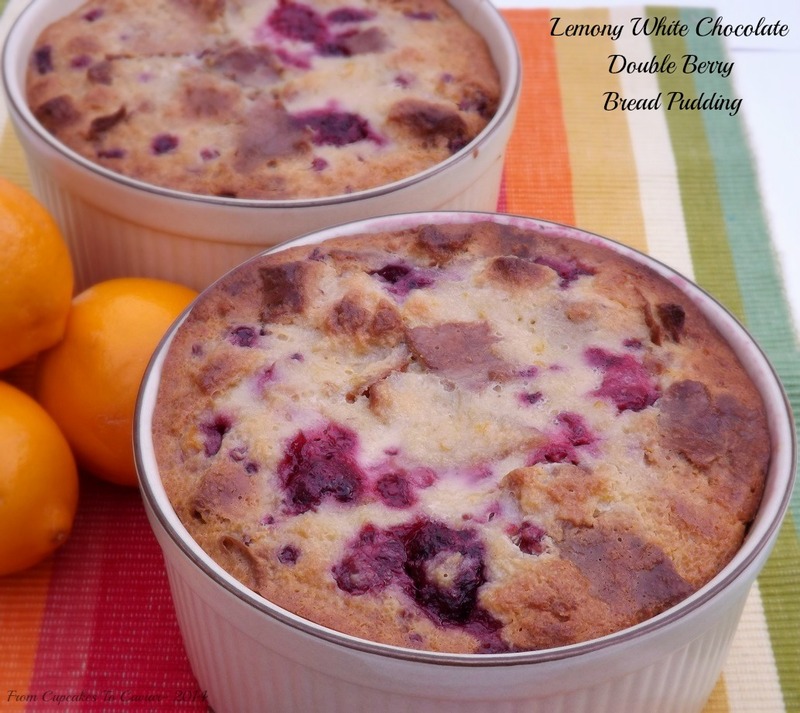 This originally comes from Cooks Illustrated and I really didn’t chance much other than I added 2 tablespoons of flour (I have bad luck at times with cheesecakes that don’t contain a touch of flour so I just put a bit) and I added the lemon and orange zests. The berry sauce is also mine but there’s nothing fancy about it though it looks it. All it is is berries and some softened up jam. I prefer uncooked berry sauces over cooked because 1) they’re easier and 2) you don’t lose the fresh flavor of the berries by cooking them. I also opened the door for a minute at the stage of turning the oven down to 200 because when researching this recipe, I read a LOT of reviews saying that theirs burned but those who said they propped the door open for a minute didn’t have that issue. I love the mild citrus flavor they added but feel free to omit them if you’re more a cheesecake purist. You know the drill… git to cookin’. Spray a 9 inch springform pan with cooking spray. Set aside. Preheat oven to 325 degrees. For the cheesecake- in a large bowl, using a hand mixer (I have tried a stand mixer with this recipe and it simply doesn’t get the bottom of the bowl well enough and you end up with lumps of unmixed cream cheese), beat the cream cheese until smooth and creamy with no lumps. Scrape the bowl once or twice during the mixing. Add in the sugar and flour and beat until combined, about one minute. Scrape the bowl again, then add the lemon juice, zests, sour cream and vanilla. Beat at low speed until combined. Add the egg yolks, then beat until combined. Add the eggs, 2 at a time, and beat each time until well combined. Spray the cheesecake crust with cooking spray (yes, the crust… ), set the crust on a baking sheet (in case of drips) then pour the batter into the prepared pan. Bake for 10 minutes at 500. Then turn the heat down to 200 degrees. Prop or hold the door open for about 45 seconds or so so heat goes down a bit quicker then close it back. bake at 200 degrees for about an hour and a half (like I said up there, mine actually took closer to 2 hours but that may be my oven so check yours at the 90 minute mark. You want this to come to 150 degrees on an instant read thermometer. It should be set except in the center 2 inches or so of the cheesecake. It’s ok if it is VERY slightly jiggly there. It will firm up during the cooling process. Transfer to a wire rack and let cool until barely warm, about 3 hours. Using a butter knife, run it along the edge of the pan between the crust and the pan. This will help loosen it up. Wrap tightly and refrigerate until cold, about 3 hours. About an hour before serving, pour your berries in a medium bowl. Gently fold in the softened jam or preserves (you can soften it simply by giving it a good stir before using it). 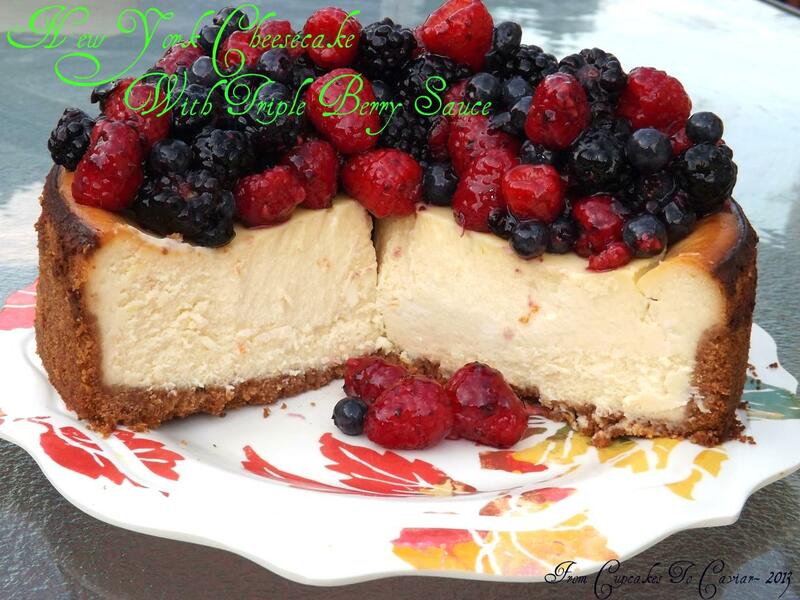 When ready to serve, either spoon the berries on top of the cheesecake or serve in a bowl alongside it.